Everyone asks the same question, "what was your favorite city?" I honestly can't choose one out of the four we visited! However, I can tell you if I had to choose I'd pick Barcelona! Spain is magical, there is no other way to put it. It is endearing, romantic, and everyone is always smiling! The city buzzes around you but no one is really in a hurry. They also have the best of both worlds, old world history and a modern society. You see some of the best architecture in the world in Barcelona, so detailed and beautiful. I would catch myself just open-mouth staring at every building. Even downtown in the central part of the city, the buildings have character. Barcelona will always have a piece of my heart and I can not wait to go back again. Let's get into what we did while in the last city of our trip! ps. if you visit to Barcelona, go to the beach... It is incredible! pss.we ate the most delicious crepes filled with nutella and various toppings every. single. night. We landed in Barcelona mid afternoon and immediately headed over to see Park Guell. It is known as "one of the most impressive parks in the world" and that is a very true statement! It was originally built to serve as a housing community but that idea didn't take and today it is a public park. There are these cute little houses with the best architectural details that reminded me of ginger bread houses! The roofs reminded me of icing and all the colorful details reminded me of different types of candy! The park also has one of the best views overlooking Barcelona! I'm terrified of heights but I made sure to get to the edge of the look out and take it all in. We ended our trip with some espresso in the park and we waited for the sun to seat before heading home! We are not huge Soccer (Futbol) fans, but when in Barcelona you have to see the futbol stadium. I mean Barcelona has one of the greatest Futbol teams of all time and they have the trophies to prove it! I didn't expect to enjoy this tour as much as I did. It was interesting to see how the soccer team gives so much to the community and how passionate the community is about the sport! I was super shocked to see that there is a congratulatory letter from President Obama framed in the museum! On the tour we were allowed to see every inch of the stadium including the press box, the locker room, the field and more! It was quite impressive to say the least! After the tour we found our way back to the city and took a cab over to our next tour of the Sagrada Familia. Honestly, the Sagrada Familia deserves it's own separate post. Words can not describe how absolutely incredible this church was. I'm talking- take your breath away- beautiful. It's designed to resemble a forest, the columns resembling massive trees and light pouring through the stained glass. It was one of the most beautiful places I've ever been. Later that night after dinner and some down time we went to the bar at our hotel, which was airing the Barcelona vs Munich game! It was such an experience watching a Barcelona futbol game IN Barcelona. I'm telling you, those people LOVE their futbol! It was like watching the Super Bowl for us, only this was a regular game for them! I can still hear the people yelling "GOOAAALLL" and cursing at the other teams players! Ugh, such an incredible night! (Dinner, the best guacamole and burritos ever. I mean, ever). I've decided I have to learn how to make crepes. I can not tell you how much I enjoyed these. I couldn't stop eating them, I had to refrain from eating them for every meal! Our last full day in Barcelona. We decided to start our day with a big breakfast and this place did not disappoint. It was such a cute little cafe with chalk board signs and modern art and pictures all over the walls. We then decided to head over and take a walk through Las Ramblas! Oh I loved that market. I made sure to try the Spanish candy and I adored all the little vendors. So much fresh seafood, fruits, vegetables. and candy!! I really wish we had a market like Las Ramblas at home! 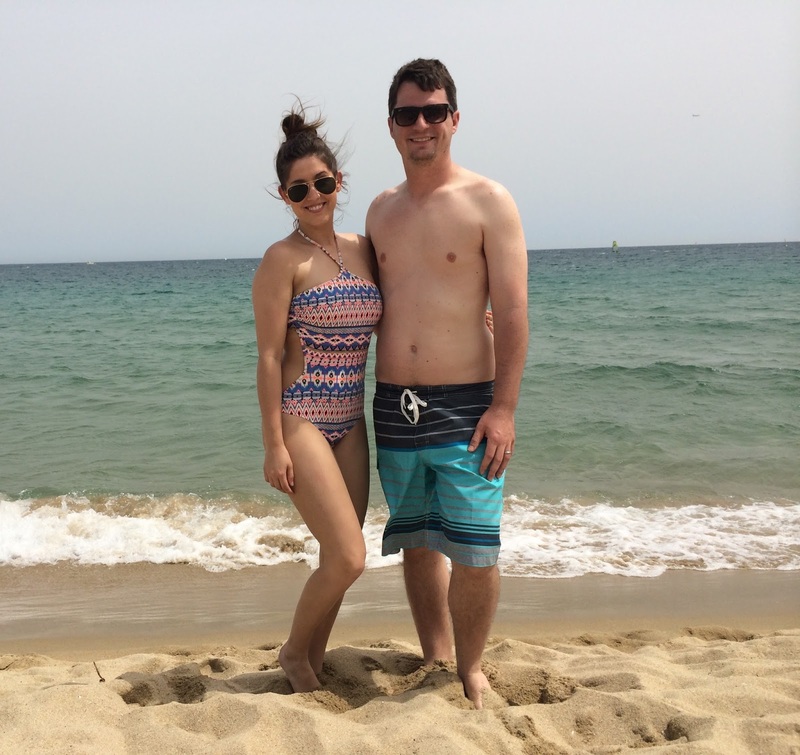 After Las Ramblas we hopped in a cab and headed straight to the beach! We spent the entire afternoon at the beach drinking Spanish beers and watching the ocean. I know it sounds ridiculous but I felt like our trip had come full circle sitting on that beach. We just laid in the sun with our feet in the white sand and took it all in. We ended our last night in barcelona with dinner (tapas) on the beach and a crepes from the cutest little crepery across from our hotel. The cutest little Las Ramblas candy and a Tomasx2 coffee!